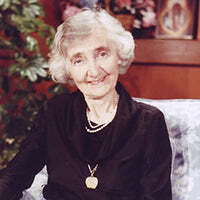 Alice von Hildebrand is the author of numerous books. Since her retirement she has been active in the Catholic world as a lecturer on countless topics and her journeys have taken her to South America, Canada, to thirty-five U.S. states, and to many European countries. In her very active television career, she has made over eighty appearances on EWTN, broadcast globally to millions of viewers, and two hundred and sixty at the Apostolate for Family Consecration in Ohio, many of them about her husband.